Suggested Usage: As a dietary supplement, take 2 capsules 1 to 2 times daily, preferably with food. Consider taking these other products: Acid Comfort, Peppermint Softgels and Bromelain. 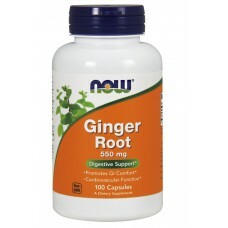 Ginger Root has been used since antiquity to support digestive function and Ginger's historical applications have been confirmed by modern research. Scientific studies have demonstrated that Ginger helps to maintain healthy gut flora, aids in the digestion of dietary fats, and can calm and soothe the digestive tract and relieve occasional nausea. In addition, Ginger possesses a number of constituents that may support healthy cardiovascular function, encourage a balanced immune system response, and may help to temporarily alleviate menstrual pain. Caution: For Adults only. Consult physician if pregnant,nursing, taking medication or have a medical condition. Keep out of reach of children. Natural color variations may occur in this product. Other Ingredients: Gelatin (capsule), Magnesium Stearate(vegetable source) and Silica.